Roy Eris (David Ajala) issues a fair warning. Syfy’s Nightflyers has an idea of what it wants to be—the next sci-fi horror, taking the best parts of The Expanse and Event Horizon and fusing them with George R.R. Martin’s beloved novella. The pieces are there for a good show, with a group of (mostly) talented actors and a promising story. Sadly, based on the first episode, Nightflyers doesn’t know how to put its own pieces together. I had the opportunity to watch the first episode of Nightflyers during New York Comic Con, along with a crowd of hundreds of fans. It was a chance to see a show that’s remained pretty mysterious before now, with only a few ominous teasers hinting at what we can expect. The first episode, “All That We Left Behind,” puts just about everything on the table—starting with a cold open where psychiatrist Agatha Matheson (Gretchen Moll), being hunted by a fellow crew member, sends a message warning people to avoid the Nightflyer. Right before killing herself with a saw blade. After that jarring opening, we’re sent back several months to where it all began. The series centers around a ragtag crew aboard a ship called the Nightflyer who are attempting to make contact with alien life. Humanity is on the brink of collapse, thanks to an environmental crisis and widespread disease. The crew’s leader, Karl (Eoin Macken), hopes that the Volcryn (which, yes, sounds exactly like Vulcan when said over and over in the episode) can help them find answers, or possibly a new home. To help the mission, Karl recruits Agatha and her patient, a powerful psychic named Thane (Sam Strike), who Karl thinks will be able to make contact with the reclusive aliens. (Oh yeah, apparently psychics are a normal thing in 2093.) Sadly, Strike’s Thane is the weakest character in the show. I can’t fully fault him, as it’s a challenging role that requires an actor who can be both intimidating and innocent, but Strike just doesn’t cut it. His idea of “powerfully imbalanced” is mostly versions of him staring intensely at the camera. Eoin Macken, Gretchen Mol, and David Ajala at New York Comic Con 2018. Thane’s arrival is when things start to get antsy on the ship. The crew, led by a hologram captain named Roy Eris (David Ajala), did not sign up for a mission where a psychic would be on board—especially not an L-1, which is apparently very powerful. We see this demonstrated with Thane attacking some of the ship’s crew telepathically and making them see things, like when one guard imagines himself hanged to death in a cell. The tension is amplified once other creepy things start happening. The launch mysteriously malfunctions. Karl sees visions of his dead daughter. Melantha Jhirl (Jodie Turner-Smith) almost dies in a...fully immersive shower tube. I guess running water isn’t feasible on a spaceship with full gravity? Agatha insists that Thane isn’t responsible, but nobody believes her—except for us, because he’s obviously a red herring. The cause of all the chaos is clearly aliens or something. The performances, with the exception of Strike’s Thane, are generally solid. Ajala gives Roy the silly grandstanding a hologram captain deserves, balancing it with a genuine curiosity for human contact (I am wondering whether he’s truly only a program, as in the novella he was a human who presented himself as a hologram to avoid people). Melantha, who is the true hero of the story, is both powerful and graceful, largely thanks to Turner-Smith’s performance. I do wish she wasn’t half-naked as often as she is in the first episode, or as hyper-sexualized. It risks falling into the trope of bi- and pansexual people being more promiscuous. That said, her love scene with Lommie (Maya Eshet) did have layers, as Melantha yearned for connection after suffering a near-tragedy. The problem with Nightflyers is the connective tissue—specifically, there is none. Things seem to happen randomly, without cohesion. For example, Karl is the one who fought for Thane to be part of the mission, but he easily joins the “put Thane in a coma so we can operate on his brain” train the very instance he’s haunted by the ghost of his daughter. Granted, it was a traumatizing experience. But given everything he’s sacrificed for the mission, and all that’s at stake, it was a moment that didn’t connect to his motivation. It could’ve worked in a later episode, but not in the series premiere. However, the biggest victim of this problem is the Nightflyer itself. Arguably the most important thing on the show, the ship is never set up. Let’s look at those first few minutes on the ship. We start with Karl’s prologue exposition, where he tells his wife and daughter he’s going to space for his mission. This all takes place in a simulation—surprise, he’s already on the Nightflyer! He and his crew are welcomed by Agatha, some more exposition happens...and then we quick cut to a hanger where they’re bringing in Thane, who’s in a locked container. Where are they? How far did they travel on the ship? None of that is answered, because then we instantly cut to a mess hall. Some guy arrives, says the ship is about to embark, and boom, they’re on the bridge. It’s all very jarring, ignoring what should be a key thing for the show: understanding the Nightflyer itself. For a series that hinges on the Nightflyer being our designated haunted house in space, we never get a sense of its layout, scope, or scale. If Nightflyers was a 30-minute show, I could maybe understand skimming through establishing the ship. But this show is an hour long, and we see at least a half-dozen different jump scares through the series premiere. If there was time to scare us twice with Karl’s creepy daughter, there was enough time for Agatha to give him a tour of the ship, letting him (and the audience) understand where things are in relation to each other. It’s the easiest exposition trick in the book, but it’s ignored. As a result, the show doesn’t feel scary. Sometimes, horror relies on the audience not understanding their surroundings. But a lost audience usually exists in tandem with a lost protagonist. Battle Royale and The Blair Witch Project are great examples of this. If the characters don’t know where they are, then neither do we. This isn’t one of those situations. Much like the ship in Event Horizon or the mansion in The Haunting, we need to be familiar with the Nightflyer before we can be terrified by it. We need to know if the medical lab is near the gym, so if Melantha’s confronted during her workout by a horrific entity, we can yell for her to run to the lab and grab a scalpel to try and defend herself. 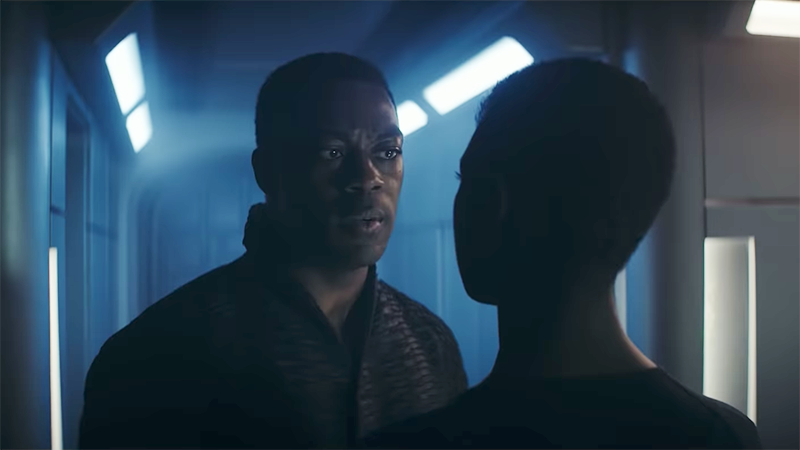 In a show like Nightflyers, the crew’s home needs to become their tomb. That can’t happen if we don’t know where they live. Nightflyers debuts on Syfy December 2, with episodes two through five airing daily through December 6, followed by the second half of the 10-episode season the following week. Keep checking io9 for more from this year’s New York Comic Con—and head to our new Instagram for lots of fun cosplay from the show: @io9dotcom.